Holiness. What is it? Why do I need it? And why is it such a struggle for me to achieve holiness in my everyday life? John Chapman explores what the Bible has to say about holiness – where it begins, how it makes progress in our lives, and its ultimate fulfilment as we are changed into Christ's glorious likeness on the Last Day. Read this book and rediscover the joy of being a sinner on the path of holiness. 4. Holiness: One sinner's testimony - the first 60 years are the hardest! John Chapman, in his inimitable way, takes us through the process of becoming more like Jesus. He explains what holiness is, where it begins, how it grows and progresses and where and how it will be fulfilled. And he does it in just 90 pages. Buy it and read it; it will feed your soul. I loved this little book because it was really easy to read and could be read and digested in one or two sittings. There was no complicated jargon to get your head round. All in all, a great book. HOW TO BE A SUCCESSFUL PERSON! <BR>What makes for a successful person? <BR>Well, a successful car is measured by whether or not it does what it was created to do. Same with people. We were created to be like Jesus (made in the image of God). So how close we are to that image is ultimately the mark of our success as people – not whether we are financially loaded or not. 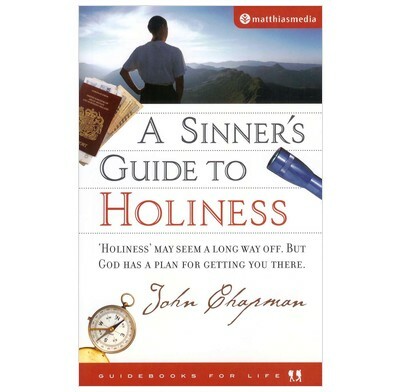 <BR>John Chapman wrote ‘A Sinner’s guide to holiness’ to help us be more successful in becoming like Jesus. <BR>There are 5 great things about it. <BR>• It is honest. It recognises we’re not all sold on the idea that we want to be like Jesus (that’s why it’s a sinner’s guide)! <BR>And it does a lot to help our motivation. <BR>• It is it is easy to understand. “Chappo” doesn’t do big words; he’s Australian! And because he has a great sense of humour you find yourself smiling as you read. You can manage a chapter a day, and do the whole book in a week. <BR>• It is very practical. It deals with how to move from where you are now, to take on more of the likeness of God. <BR>• It is very encouraging. It is easy to give up trying to be Christ-like when we think it’ll never happen. So it is good to realise this is what God will make us one day. In the kingdom of Jesus we shall be like him. So with that assured end-result in mind, it doesn’t hurt to get a bit of practice in before-hand. <BR>• It is cheap! It’s only a fiver!